This being Doctor Who, a deep frozen Martian goes on a rampage and the crew are saved by the timely appearance of the TARDIS. A mash up of Hunt for Red October and Alien, Mark Gatiss constructs an effective (if not ground breaking) tale that certainly had my 9 year old daughter on the edge of her seat torn between covering her eyes and not wanting to miss a moment. Wisely, Gatiss manages to get his monster out of the rather cumbersome and lovingly recreated costume with which it was endowed in the Sixties and a pair of spindly claws provide most of the shock moments. As a horror buff, he knows that the real horror lies in what you can’t quite see but know must be lurking in the shadows. There are some turns one expected the script to take which it doesn’t: the morality of using nuclear missiles which Who explored in the eighties in stories such as Battlefield isn’t a topic for debate. David Warner’s New Romantics loving Professor side, the crew members lack the quirky personality traits that might make us feel a pang of regret when they got chomped up and eviscerated by the Ice Warrior. But Gatiss does manage to embue his monster with a certain nobility and a backstory that will inspire fanfiction for years to come (or more likely a sequel next year). 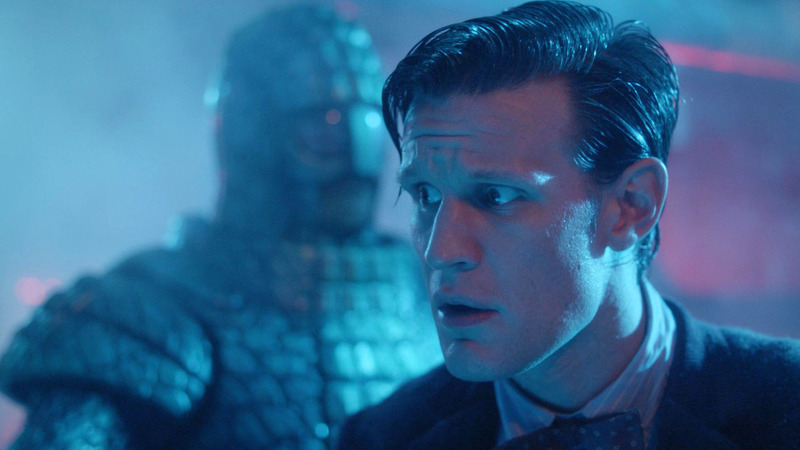 There are some nice moments for Clara as she becomes the envoy to the monster in captivity and as she manages to find the emotional appeal that stops him plunging the world into a nuclear exchange at the story’s climax. But Gatiss’ script is brought wondrously to life by a hugely realistic set (kudos to Michael Pickwoad for convincingly creating a sub in a Cardiff studio). And the direction of Douglas MacKinnon is faultless. Expertly ratcheting up the tension, making brilliant use of lighting and a gorgeous colour palette that uses reds, blues and greens to stunning effect this is a textbook example of how good Who can look. One of the nadirs of 80s Who, is the infamous warriors of the Deep in which green reptile monsters invade a deep undersea base. The contrast between the fluorescently lit eighties story and last night’s offering isn’t just about thirty years of technology – it’s about the love and care for the show by the off-screen talent that’s so evident onscreen. I suspect familiarity may breed contempt with this episode: it probably doesn’t have the emotional depth of 2005’s Dalek and when you know how it al plays out some of the genuine tension-filled moments may lose their impact on repeated viewings. But as a faithful epitome of what classic Doctor Who at its best was capable of, Cold War will, I suspect, become a rapid and longlasting fan favourite.